Situated by the New Meuse River in Rotterdam, EuroLoop will be the world's largest research and test site for the calibration, verification and type testing of industrial flow meters in the oil and gas industries and for the performance of industrial experiments involving process technologies and flow. The plant comprises two separate, industrial scale closed-loop test circuits - one for liquid meters and one for gas meters - on a brand new, self-contained 200 x 100 metre site that also houses the control room, meeting rooms and an educational centre. Being entirely self-contained, EuroLoop will operate independently of external factors, maximising the availability of the calibration facilities. EuroLoop is owned by NMi, a world leading independent specialist for testing, certification, calibration and training in the field of metrology. The two closed-loop calibration circuits at EuroLoop have been constructed as separate projects. Each has adopted different valve actuation technologies, both supplied by Rotork. The circuit for gas meters, including compressors, a heat exchanger, gas holders and a lubrication system in addition to the master meter circulation system comprising turbine and ultrasonic flow meters, utilises Rotork IQ and IQT intelligent electric actuators with Rotork Pakscan two-wire digital control. The IQ actuators are fitted with Rotork Gears IW worm gearboxes for the operation of the larger ball valves. The IQTs are direct drive quarter-turn actuators. The service parameters of the ATEX Zone 1 explosionproof plant are very demanding, involving flow rates up to 30,000m3/hr in pipe sizes up to 30inches at pressures up to 60bar. Safety is therefore of primary importance and for this reason virtually all the ball valve installations are of double block and bleed design, the largest weighing in at eight tonnes. Security against leakage is vital for the accuracy of the metrology as well as safety. 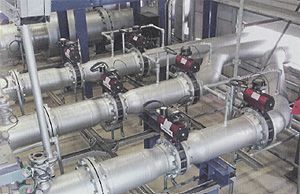 The other plant at EuroLoop, for liquid meter calibration, consists of three circulation systems, each comprising large and small circuits and each equipped with master meters of various sizes, together with pumps and coolers. The circuits can be connected to one of two piston provers, either for master meter calibration or for testing directly against the provers. Service parameters involve flow rates up to 5000m3/hr at pressures up to 10bar. Virtually all the valves on the circuits are butterfly valves, operated by Rotork RC200 range pneumatic actuators, equipped with Series 1990 switchboxes and PMV positioners, supplied by Rotork's agent in Belgium, Prodim SA. Both plants are fully automated, the gas plant requiring 85 electric actuators and the liquid plant requiring 43 pneumatic actuators. The annual testing capacities will be up to 1500 gas meters and 600 liquid meters when the plant is fully operational later this year. On the control side, each calibration circuit has adopted different architectures although the two systems are linked together for safety reasons. 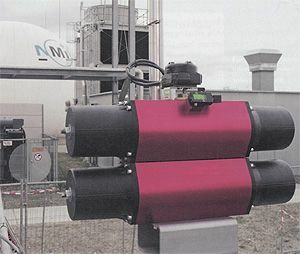 Whilst the forty-three pneumatic actuators on the liquid circuit are conventionally hard wired, the greater number of electric actuators on the gas circuit can take advantage of the economies of scale provided by a single Pakscan two-wire bus highway, connected to the latest Rotork Pakscan P3 master station. The master station links to the next level of control, the safety PLC controlling the pressure and temperature parameters of the plant's operation. This encompasses a complex package of tasks involving approximately 800 input/outputs, which, besides preventing over pressure and other safety-related duties, also carries out the measuring operations required for calibration. Any fault would be detected at this level, triggering an immediate shut down of the circuit. At the same time, the PLC would communicate with the safety PLC on the liquid circuit to close that down as well, ensuring total plant integrity in the event of an emergency. 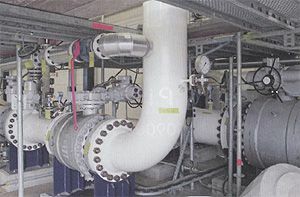 The PLC design and the design of the flow computers and PC based SCADA and calibration management system that supervises the operation of the EuroLoop plant has been provided by two Dutch companies - Spirit IT for the gas facilities and Krohne Oil & Gas for the liquid facilities. The day-to-day operation of the valve actuators is fully automated with local operation from HMI stations also available. Operation of the individually addressed IQ valve actuators is additionally available at the Pakscan master station. In general, the better the quality of measurement and calibration, the better it is for the environment. Good measurements ensure that more products meet the standards demanded and therefore less is wasted. Manufacturing processes are also easier to supervise as a result. High quality measurements not only benefit the environment but also have economic benefits. Millions of cubic metres pass through the oil and gas networks of the world annually for production, transport and distribution. Measurement figures form the basis for costs and revenues, so a miniscule deviation can make a difference costing millions. It is therefore of great economic importance that measuring instruments are calibrated to the highest level. The single sourcing of valve actuation and control equipment from Rotork has provided a number of additional benefits for the EuroLoop project. EuroLoop Project Engineer Wim Volmer explains: "We looked at various suppliers before selecting Rotork on the merits of the equipment offered and, of course, value for money. For example, on the electric side, the Rotork IQ actuator delivers valve diagnostic capabilities which, although not an essential requirement for this plant, are still very useful for the plant operator by eliminating the requirement for over-cautious routine valve maintenance. In addition, the Pakscan two-wire digital control system is economical to install, assists swift commissioning and provides a dedicated, reliable link for communication between the actuators and the plant's SCADA system. The close proximity of a Rotork office and workshop in Rotterdam is of great assistance on a practical, logistical level. Rotork has been able to fit virtually all the IQ actuators to the valves in the workshop and supply them to site as complete, factory tested units. Also, although the different actuator products are manufactured in Rotork factories in the UK and Sweden, the Rotork company in Holland provides us with fully qualified service technicians for on-site support, literally on our doorstep."